I'm back after just a week and not a year, score! The randomness I will be talking about today is EA Sports newest entry to their college football franchise, NCAA Football 12. With current consoles having a longer life span than of years past, it's becoming harder and harder for sports franchises to release their sporting games with clear cut improvements over previous iterations. No longer can video game developers back on having improved graphics like years past. Good game, just not a huge improvement over NCAA Football 11.Being a huge football fan and getting pissed off that this NFL lockout still hasn't been resolved, I decided to take a look at NCAA Football 12 to get my football fix. Before rushing out and dropping $60 on the game, I downloaded the demo on XBOX Live and gave it a go. I wanted to see if there were vast improvements over NCAA Football 11, which I own, that would warrant the cost. After getting the demo downloaded, I was happy to see that one of the demo teams to play was my favorite real life college football team, the Florida State Seminoles. The first thing I noticed was the extra pageantry of the game introductions. Anybody that watches college football knows that every school as their own traditions and pageantry's; so this gave the game a lot more flair and passion. Even though it was cool to see the Florida State mascot ride out onto the field and perform the normal pre-game ceremony, it definitely was not a selling point. When I play sports games, I want to get into the action and start playing. I would probably watch the different intros for the first time when I saw them, but would undoubtedly skip over them on the next go around. 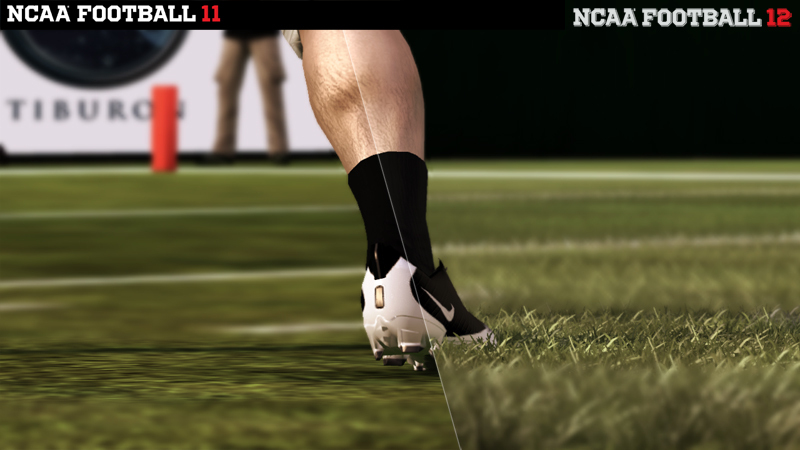 Speaking of getting into the game, the action on the field was almost identical to that of NCAA 11. EA Sports claim there are new blocking mechanics and a new tackling system, but I didn't see anything new "under the hood" that changed my overall gameplay experience. A couple of new features that were apparent; however, were players now had dreadlocks and the grass was in 3D. When reading up on NCAA Football 12, EA was pretty thrilled that players now could have dreadlocks fly through the air and that the grass was in 3D. ZOMG, 3D grass, I'm sold! Oooh, 3D grass... umm, yeah.Except not. While I am not an EA basher, like many "gamers" out there, I own a multitude of EA games. Keep on eye out for this game, it looks fantastic. Go download the demo now, on either XBOX Live or PlayStation Network for a taste.I just was not convinced that these "new" features warrant the $60 price tag. Don't get me wrong, if you like college football and don't own last years version, by all means pick up 12, you will not be disappointed. If you're in my boat and already own NCAA 11, I recommend you do what I am going to do, save your $60 and go pick up Atlus' new title Catherine which comes out next week, July 26. That game looks amazing and unique, something that games have been lacking lately. Well, this will conclude our nice fireside chat for today. Stay tuned for what randomness I will talk about next time in Episode 3 of Conversations with IrishPride. Until then, go outside and check out some 3D grass!